The Member of the Month is an amazing woman. This year she has been a huge help to our chapter and shown herself to be a great leader. As soon as she volunteered to be an LPM she spent time asking questions, learning, and planning. Wasting no time, she held her first Ways and Means fundraiser in May. Every month since then she has had something fun planned for our chapter to do or help with; baskets, re-gifting, sales and more. I am eagerly waiting to see all of the great plans she has for the rest of the year. Please join me in congratulating Delores H as our September member of the month. We are lucky to have her in our organization. The Member of the Month is an amazing woman. She is always kind and helpful. She is a huge supporter of our service projects and is willing to lend a hand when needed, including hosting not one, but two monthly meetings. This month she was especially busy co-chairing both the Highway Clean Up and the Bingo Night at Ambassador. Please join me in congratulating Marion H as our October member of the month. We are lucky to have her in our organization. The Member of the Month is an amazing woman. 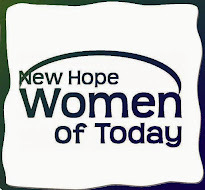 She has passion for New Hope Women of Today. She is a team player whose focus is community and the chapter. This year she has been doing a lot of work behind the scenes supplying the board with relevant information and chapter history. Over the last few months, she has been busy organizing our Shopping Spree and Cookie Exchange. Please join me in congratulating Judy S as our November member of the month. We are lucky to have her in our organization. The Member of the Month is an amazing woman. She is active all year long helping with various projects. It should come as no surprise to anyone when I say this member is the most festive and jolly of the bunch. She goes above and beyond to support our Shopping Spree and is a long time co-host of our cookie exchange. Please join me in congratulating Sandy B as our December member of the month. We are lucky to have her in our organization. The Board member of the 2nd Trimester is another amazing woman. She volunteers to chair projects, writes newsletter articles and Top Banana notes, attends all of the board meetings, and always gets information out to the chapter in a timely fashion. In October, it was her reminder on a Sunday night that helped me realize I forgot to create the agenda. She is an extremely valuable member of the board this year. Please join me in congratulating our Secretary, Carole C as our Board Member of the 2nd trimester. We are lucky to have her in our organization.